An intimate and investigative portrait of the life and death of beloved Mexican American singer Selena Quintanilla Pérez by Emmy Award–winning journalist María Celeste Arrarás. Now a major series by Telemundo. There is no doubt that Yolanda Saldívar pulled the trigger and killed Tejano superstar Selena on March 31, 1995. But does anyone know what really happened in Room 158 of the Days Inn, moments before the crime took place? María Celeste Arrarás has many answers, and her unrivaled coverage of the murder, trial, and aftermath made her the undisputed expert on the case. 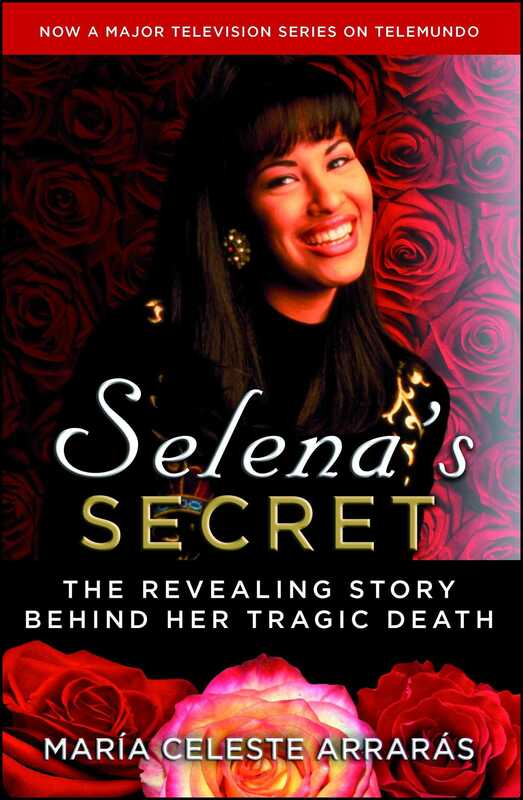 Arrarás shares firsthand information about the crime and the people involved—including details of her headline-making jailhouse interview with Saldívar, who repeatedly spoke of “Selena’s secret”—a powerful hidden piece of information that she refused to reveal in court but that she shared at length with Arrarás. Many questions were raised and not all were answered…until now. Why was there a suitcase filled with Selena’s clothes at the murder scene? What was the significance of the jeweled ring adorned with the initial S that fell from Selena’s bloody fist? Who was the doctor from Monterrey who called himself Selena’s confidant and business adviser? Selena’s Secret fits together the pieces of this puzzle and depicts what really happened in the months prior to her death that led to the tragic events of that rainy day in March. “Selena’s been shot!” someone yelled. I heard the announcement shortly after 2 P.M. on that Friday afternoon as I walked through a hallway at Univision, on my way to the newsroom of the network’s news division. That is where the offices of my show, Primer Impacto, are located. At first I mistakenly thought that the victim of the gunshot had been Selegna, a well-known Miami psychic who often appears on television. As incredible as this may sound now, my first thought was that the shooting was part of a conspiracy, an organized plan to finish off psychics and astrologers; two weeks earlier an astrologer who had a radio show had been shot to death in Miami, where our show is based. Perhaps the murderer was a serial killer unhappy with his astrological forecasts. New York City already had its own zodiac killer—a name assigned to him after he threatened to kill one person on the first day of each astrological cycle. As soon as María finished her words we all fell into deep silence. My colleagues had found out the news just a few moments before I had and had yet to catch their breath. Selena had been a guest on our show several times. Her last appearance had taken place barely three weeks earlier. This time the victim was not a name without a face. It was someone we knew. We all liked her because despite her fame, she never put on airs of being a superstar. On the contrary, she was quite down to earth. Within seconds we swung into action. We had to immediately interrupt regular programming to report the event. At that moment our professional commitment had priority over any of our personal feelings. A powerful charge filled the air and took hold of our group—that special current that flows through every journalist who realizes they’ve come across a truly major piece of news. That energy becomes our fuel, allowing us to work long hours with enthusiasm, without thought of food or sleep. That day we were going to need it. Moved by that unusual force, we leaped to our tasks. Within fifteen seconds, I was seated at the Univision news desk in front of the standing cameras. I did not have the time to run to the studio on the other side of the building where Primer Impacto is taped. With news like this, you cannot afford to waste one single second. As I hastily put on my mike and earpiece, arrangements were being made to interrupt our regular programming. The earpiece, which we call the IFB, is connected to a cable line that allows us to receive instructions from the producer and director who work from the control room. The technological magic of this little device has come to our rescue innumerable times like this one, when we receive late-breaking news and we are forced to improvise. I remember turning around and seeing an army of people glued to their phones, frenetically hunting for any details of what was happening to Selena. The room was tense. We were working against the clock, trying to break the news before anyone else. The goal was to provide the greatest amount of information possible in that first bulletin. We knew Selena had been shot in a motel in Texas and had been taken to a hospital where she was undergoing emergency surgery. Other than that we had no clue. We did it. We were first with the news. Normally, this is cause for celebration and congratulations. In the world of news reporting, timeliness and credibility are of utmost importance and are achieved only by being first on the air with the most precise account of an event. But this victory was a bittersweet one. The news could not have been sadder or touched us more deeply. After the news brief, I turned to my computer. There still was nothing to be found on the wire services about this event in Texas, which meant that we were way ahead of the other news media. The phones at Univision would not stop ringing. Viewers were calling in disbelief, hoping we would tell them we had made a mistake. At that moment, even we did not imagine that we were facing the most important news of the year for Hispanics. Our news team had its hands full: searching for videos of Selena, calling the Days Inn, the hospital, the singer’s home, her boutiques, her friends, her relatives. The information we were getting was contradictory, and there were no reliable sources we could count on to keep our public informed. These words left me chilled to the core, as though someone had drenched me in ice water. In those thousandths of a second, many thoughts and feelings raced through my mind, but the habits of my profession helped me respond rapidly. Neither my expression nor my words betrayed me. I heard myself announce that Selena had died. When the special bulletin was over, I thought of how young Selena was. She was only twenty-three years old! What could possibly have happened? A wave of terrible rumors rocked us in the minutes that followed. Someone heard a conversation on the internal radio frequency used by the Corpus Christi police. One officer was saying that it was all due to a love triangle between Selena and the Tejano music singer Emilio Navaira, who was also married. Supposedly his wife had shot Selena after surprising the two in each other’s arms. The rumor was reported on some local radio stations but was quickly dismissed. Then there was gossip that Selena’s assistant had killed her in a confrontation that hinted at a lesbian affair. But we aired nothing of what we heard until we were able to ascertain what was true. We avoided the temptation of repeating unsubstantiated rumors just to make the news more impressive. For that reason, I feel proud that nothing was ever said on our show that did not adhere strictly to the truth. My team shares those journalistic ethics, and although there are those who say that our show smacks of sensationalism, on that day we proved, once again and above all, that Primer Impacto is a responsible show. In the middle of the afternoon I really felt the absence of my cohost, Myrka Dellanos-Loynaz. Of all days to have off! When there are two anchors and there is breaking news like this, the pressure is not as intense because it is being shared. Not only is the actual workload carried by two people, but also when you go live on the air, it is much easier to squeeze out of a tight spot. As one of us is speaking, the other one is mentally rehearsing what she will say next or is listening to instructions via the IFB. When you are alone in front of the camera and have to improvise because there are last-minute changes or new information, you are forced to simultaneously concentrate on what you are saying and pay attention to whatever it is you are being told from the control booth. Believe me, there is an art to talking and listening at the same time and to being able to make what you are saying come across as logical and coherent. It takes years of training to learn this skill. At one point, we received a call from the reporter we had sent to the Days Inn. She had verified that Selena had been shot by the woman who managed her clothing business. Her name was Yolanda Saldívar. But there was more: The suspect had holed up inside a pickup truck in the motel’s parking lot. At that exact moment, she was holding a gun to her head, threatening to kill herself. The show’s producers flew into a frenzy. They were immediately trying to get a satellite feed from Corpus Christi to obtain live coverage from the Days Inn. In order to save time—we were in the midst of preparing for our 5:00 edition of Primer Impacto—we moved a TV camera to my desk in the newsroom, where I had my computer and the wire service updates at my fingertips. I would be able to continue working on my script for that evening’s broadcast while at the same time updating viewers with special bulletins as I received information through the wires. Just a few minutes before the start of Primer Impacto, I passed the control room on the way to the set. Madness reigned. There were so many reports coming in from the news wire at the same time that a river of paper was flowing from the printer. The telephones rang incessantly. The director shouted instructions nonstop. On the various TV monitors I could see half a dozen of our correspondents getting ready to go live during the show. They awaited their turns in front of Selena’s boutique in Corpus Christi, in front of her store in San Antonio, at the hospital and in front of the singer’s house. Our Los Angeles correspondent already had several people lined up, waiting for their reaction to the tragedy. María López talked into two phones at the same time, giving instructions to each of the Primer Impacto bureaus in Texas that she had on the line. She slammed down one receiver and continued the other conversation. “I want live coverage [of Yolanda Saldívar] right now!” she hollered, pounding the table with her fist. “We have to start with that!” In order to get the job done, an executive producer has to be strong-willed. Luckily for us, María could more than handle the job. I rushed to our set with the script notes that I had made that afternoon in hand, knowing they might be useless. You cannot plan a show when the news takes on a life of its own. As I reached the Primer Impacto desk, I took a deep breath. I was ready for what awaited me. These moments of tension and uncertainty are the most powerful ones of our profession. For me, they are also a fascinating challenge. It was a great shame that all this energy stemmed from such a sad event. Unfortunately, that is not uncommon. News of this magnitude is often tragic. At the top of the hour we began our broadcast. As the opening headlines rolled, María warned me that we were having an audio problem with the satellite signal from Corpus Christi. If we could not correct it in time, we would lead off with our correspondent in San Antonio. It was not what we wanted but we had no other choice. When I started my report on the afternoon’s events, I received cues through the IFB to “stretch” my opening comments. The audio signal was about to be corrected. “Stretching” is TV slang for improvising, for killing time by talking; it allows the technical crew more time to fix the existing problem. Lucky for us, we needed only a few seconds. As soon as I heard the producer’s magic words, “We’re rolling; let’s go to the motel,” I introduced our reporter at the scene. It was riveting to watch the action unfolding there. Dozens of police officers, armed to the teeth, surrounded a pickup truck. From far away, the cameras could barely make out the figure of the woman inside who had turned herself into her own hostage. Police were keeping reporters and their crews from getting too close to the scene. Now I understand why: The negotiations to obtain Yolanda’s surrender were going nowhere. Using a cellular phone installed in the truck, she kept in contact with the agents, but her other hand kept the gun barrel pressed to her temple. On more than one occasion she requested that all TV cameras be removed from the area. Months later during the trial against her, it became clear how tense and dramatic the conversations between the suspect and the officers truly had been. But on this afternoon, no one imagined that Yolanda was disclosing powerful information from inside the truck and that her words were being recorded. In Corpus Christi, we went live to another location where a press conference was being held by someone who was not well known at this point: Abraham Quintanilla, Selena’s father. Beaten down by his pain, barely able to maintain his composure, he confirmed what we already knew and answered a few questions from reporters. He acknowledged that the prime suspect had been employed by his daughter and declared that for some time they had had problems with her because she was stealing from them. At first glance it all seemed very simple. The truth would prove to be far more complicated. From there we went live to several other locations in Texas and California, finding people already in tears over Selena. From the control room we used different satellite feeds to capture the mournful reactions from across the country. We spoke with a tearful member of the musical group the Barrio Boyzz, a Latin group with whom Selena had recently taped a music video. We found him in Puerto Rico. His quaking voice made it obvious that he had just found out the news. In the middle of the buzz and frenzy a producer rushed into the control room with a video exclusive—one never seen before—for us to air. Someone in our affiliate station in Corpus Christi had unearthed it in their video library and sent it to us via satellite. The tape shows Selena and Yolanda on the day the singer opened one of her two clothing boutiques, Selena Etc., a few months before the murder. The images barely fill twelve seconds of airtime, but during those moments the two characters appear to be displaying a wide range of emotions. They stand alone in a corner, whispering in each other’s ears. Selena appears to be sharing a secret with Yolanda. We see how at first Yolanda’s reaction is serious, then surprised and finally amused. Seeing them like this, gossiping and laughing, it was obvious there was a great camaraderie between them. But what secret were they sharing? What were they talking about? We watched the video in slow motion and the effect was chilling. They seemed so inseparable, such close friends. And to think that just a few hours earlier one of them had put an end to the other’s life. Who would have imagined it? Even now, after all this time, when I watch those images I get goose bumps. In short, we dedicated the entire program to the topic of Selena’s death. Even our meteorologist, John Morales, who usually was caught up in his weather satellites and forecasts and who had yet to learn of the events, had to do a last-minute weather forecast for Corpus Christi. It would rain that night. To close the show we repeated part of the interview we had done with Selena weeks earlier. Ironically, it had become the last live interview Selena would ever give. Watching her talk about her plans for the future gave the show an unforeseen dimension. It would chill anyone’s blood. I remember her describing her dream home. She had bought ten acres of land in Corpus near some botanical gardens and described how in the early evening hundreds of birds would fly by. She wanted to build the house overlooking a lake because “it was the most romantic view of the property.” Now this would never be. Thankfully, the show came out “clean,” without technical errors, as we say in our business. Our viewers would never know we had been walking on eggshells from beginning to end. And we had never looked down. The standoff seemed endless. We were ready for a resolution at any moment. Since our national edition is not seen in California until three hours later, we stay at the studio whenever there are new developments in a major news story so we can air them live on the West Coast. In this case, it was absolutely necessary. So we produced an entirely new edition for our West Coast audience. Yet when we finished at 9:00 P.M. Miami time, negotiations between Yolanda and the police were still in the works. Although it was a Friday night, we immediately had to start preparing a special show dealing with the events for the following Tuesday’s regular late-night edition of Primer Impacto. The first thing we did was to send our then host in charge of the entertainment segment of our show, Mauricio Zeilic, to Corpus Christi to cover the funeral and its related events. Mauricio is much happier when you give him plenty of time to get ready for a plane trip. He needs the time to prepare himself mentally against his panic-level fear of flying. But on this occasion, despite the short notice, he was able to manage his fears in light of the magnitude of what was happening. “What time’s my flight?” he asked gently. In a few hours he was on board a jet like a true professional. Without a moment’s break, we contacted all our correspondents in Mexico and the United States so they’d be available to work the weekend. The storm of events required that we have the widest coverage possible. As always, once we were finished with our broadcast, we were still wired. But once we were back to our relatively normal pace, I had time to process events. I could not rid my mind of the picture of Selena and Yolanda, talking privately and laughing like the best of friends. I kept asking myself the same questions over and over: Who was this mysterious woman and why had she shot such a sweet and charismatic girl? What had happened inside room 158 of the Days Inn motel? What was the one event that set off this tragedy? At that moment, I became determined to find the answers. I never expected that it would take me so many long months to find them. Shortly after 10:30 P.M. that evening, I heard a yell as disturbing as the one that first told me Selena had been shot. “She’s turned herself in!” I turned to the twenty monitors that cover our newsroom wall and I saw a whole gang of Yolandas, one on every screen. One policeman was covering her with a jacket to protect her from the cameras and the rain. John Morales had been right: It was pouring. Although the officers moved Yolanda into the patrol car as fast as they could and sped her away, the seconds seemed to trickle by in slow motion. It was at that moment that I had the instinctive feeling that this was not the end, but the beginning of the story.